N and I are fresh off the plane from my hometown in Kentucky and jet lagged. N went back to work this evening to work nightshifts for the week which means I won’t see as much of him this week what with me working 9 to 5ish and then a James Bond themed Xmas party on Friday (at a casino… Oh dear!). That made this morning’s excursion to find a Christmas tree all the more meaningful. We’re novices when it comes to Christmas trees. We’ve had more than 5 Christmases together now in total but because we swap years between my family in the USA and his here, we’ve not really seen the point of having one until the year before last when we celebrated our Christmas on Boxing Day after having spent Christmas at his mum’s. Our tree was lovely. It was full. It was elegantly decorated (I’d like to think). And it smelled of vomit. I’m not even kidding. Our tree smelled of vomit. Turns out, SOME trees (ie OURS) rot at the base where they’ve been cut. Yep. So for days we kept talking about the “funny smell” which then turned into the “foul smell” which turned into the “OH MY GOD WHAT IS THAT? ?” smell. Poor N ended up with his face down in the tree to confirm that it indeed was our lovely pinnacle of Christmas spirit. He still has flashbacks. Needless to say, that bad boy ended up in the trash as soon as we’d opened gifts. We vowed that we might not ever have a real tree again. Last year we were in KY and my family dabbles in fake trees so we were ok there. This morning, we took a walk up to Balham after we woke up, partly to take in some sunshine and help with the jet lag and partly to pick up some essentials. From across the street, I spied a smallish tree. On the way home, I made sure we walked on the opposite side of the street so I could get a better look. Just at two foot tall, this tree could sit on our table no problem. 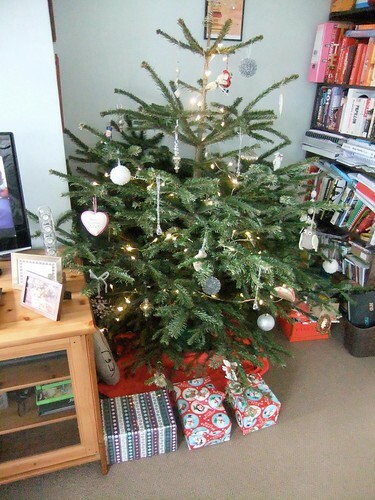 At £30 it was a little more than I wanted to pay but a fake tree would cost as much and be less nice plus present with storage issues in our small studio flat. So N carried it home. We put on “The Bubble’s” (Michael Buble’s) Christmas album and set to work decorating our mini tree. And actually? I think I like this tree more! It’s not taking up a huge amount of space, it’s on top of a table that’s meant for 4-6 so half of the table is still useable and it’s easy to maintain! I’m very happy with it. And this year, the ornaments on the tree mean a bit more. 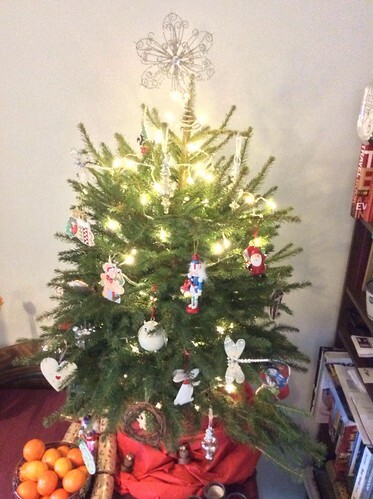 With our last tree, I tried to take a page from N’s mum’s book and decorate the tree quite matching and posh which is totally fine but this year I’ve added loads of homemade ornaments that my Memom has made and given us over the many years. This year’s tree reflects much more of our personality, complete with an ornament shaped as a taco (you can just barely see a bit of it on the left hand side, mid tree). What’s the story with the taco, you ask? WELL. My grandparents have always had a pickle in their tree… it’s a thing. Read more about the Christmas Pickle here. I don’t have a pickle. But while out browsing in Hobby Lobby last year my granddad (my buddy) found a taco shaped ornament and put it in the cart “because Steph would like it.” That excuse drives my Memom nuts, but it found its way to the till and we’ve had the taco ornament for two years now. Oddly enough, it’s one of the ones I cherish the most and I wrap it up carefully during the year. I’d be so sad if something happened to it. So, sorry for the rambly-type post. Consider it fuelled by a horrible combination of loneliness, jet lag and rum and coke. We’ve got such a tiny place it’s pretty over the top just putting a tree up! But I just couldn’t not have one. I love it! Matt and I have a 4ft fibre optic fake one that’s been with me since I was 18. It’s perms antsy stooped since our cats knocked it over as kittens and some bare spots where a student party may have gotten out of hand and led to some burns and melted leaves. He looks a bit tragic in our bigger adult houses but I can’t bring myself to upgrade until he truly bites the dust. I love the rambly post and the color scheme you have made with this layout! I’ve always had real trees, but I guess they got old fast, and therefore, my dad wanted to get fake. I guess fake is better since all you do is take them down and shove them in a closet somewhere that fits. Or the storage if you have room. I do love your mini tree though. It’s very cute! Ever since I started growing older, I’ve always had fake trees. I’ve had two fake trees handed to me last year by apartment tenants, that knew I couldn’t afford one. However, one I had to prop up because it’s legs were gone, and the other had them in vase. lol. Thank you for sharing a bit of how you got your taco ornament. I didn’t know they made them! LOL. Have a wonderful Christmas!